Cardiopulmonary resuscitation, commonly called CPR, combines rescue breathing (one person breathing into another person) and chest compression in a lifesaving procedure performed when a person has stopped breathing or a person's heart has stopped beating. When performed quickly enough, CPR can save lives in such emergencies as loss of consciousness, heart attacks or heart "arrests," electric shock, drowning, excessive bleeding, drug overdose, and other conditions in which there is no breathing or no pulse. The purpose of CPR is to bring oxygen to the victim's lungs and to keep blood circulating so oxygen gets to every part of the body. When a person is deprived of oxygen, permanent brain damage can begin in as little as four minutes and death can follow only minutes later. There are three physical symptoms that indicate a need for CPR to be performed immediately and for emergency medical support to be called: unconsciousness, not breathing, and no pulse detected. Unconsciousness is when the victim seems to be asleep but has lost all awareness and is not able to respond to questions or to touch or gentle shaking. A sleeping person will usually respond to a loud noise, shouting, or gentle shaking. An unconscious person will not respond to noise or shaking. When unconscious, a person can not cough or clear the throat, which can block the windpipe and cause suffocation and death. People with a major illness or injury or who have had recent surgery are at risk for losing consciousness. If the person has fainted, which is brief unconsciousness, the cause may be dehydration (lack of body fluids), low blood pressure, or low blood sugar. This is a temporary condition. If the victim is known to have diabetes, a bit of fruit juice may revive the person once they have regained consciousness. Not breathing, which is also called apnea, is the lack of spontaneous breathing. It requires immediate medical attention. The victim may become limp and lifeless, have a seizure, or turn blue. Prolonged apnea is called respiratory arrest. In children, this can lead quickly to cardiac arrest in which the heart stops beating. In adults, cardiac arrest usually happens first and then respiratory arrest. The common causes of apnea in adults are obstructive sleep apnea (something blocks the airway during sleep), choking, drug overdose, near-drowning, head injury, heart irregularities (arrhythmia, fibrillation) or cardiac arrest, nervous system disorders, or metabolic disorders. In children the causes may be different, such as prematurity, bronchial disturbances or pneumonia, airway blockage or choking on a foreign object, holding the breath, seizures, meningitis, regurgitating food, or asthma attacks. If the rescuer is unable to detect a pulse or has difficulty in feeling a pulse it can be an indication of the use of improper technique by the rescuer, or shock or cardiac arrest in the victim. If a sudden, severe decrease occurs in pulse quality (such as pulse weakness) or pulse rate (how many beats in a minute) when other symptoms are also present, life-threatening shock is suspected. The rescuer may need to explain to a doctor or medical professional where on the victim's body the pulse was measured, if the pulse is weak or absent altogether, and what other symptoms are present. Medical help and CPR are needed immediately if any of these symptoms is found. Time is critical. A local emergency number should be called immediately. If more than one person is available to help, one can call 911 or a local emergency medical service, while the other person begins CPR. Ideally, someone CPR certified performs the procedure. Local medical personnel, a hospital, or the American Heart Association teaches special accredited CPR courses. If a critically ill patient or post-operative patient is being cared for at home, it is a good idea for a family member to take a CPR course to be better prepared to help in case of an emergency. If the victim appears to be unconscious with either no breathing or no pulse, the person should be shaken or tapped gently to check for any movement. The victim is spoken to loudly, asking if he or she is OK. If there is no response, emergency help must be called and CPR begun immediately. The victim is placed on his or her back on a level surface such as the ground or the floor. The victim's back should be in a straight line with the head and neck supported slightly by a rolled up cloth, small towel, or piece of clothing under the neck. A pillow should not be used to support the head. The victim's clothing should be loosened to expose the chest. The rescuer kneels next to the victim, tilts the victim's head back, lifts the jaw forward, and moves the tongue forward or to the side, making sure it does not block the opening to the windpipe. The victim's mouth must be kept open at all times, reopening as necessary. The rescuer listens close to the victim's mouth for any sign of breathing, and watches the chest for movement. If the victim is found to be breathing, and has perhaps fainted, he or she can be placed in the recovery position until medical assistance arrives. This is done by straightening the victim's legs and pulling the closest arm out away from the body with the elbow at a right angle or 3 o'clock position, and the other arm across the chest. The far leg should be pulled up over the victim's body with the hip and knee bent. This allows the victim's body to be rolled onto its side. The head should be tilted back slightly to keep the windpipe open. The head should not be propped up. If the victim is not breathing, rescue breathing begins, closing the victim's nostrils between a thumb and index finger, and covering the victim's mouth with the rescuer's mouth. Two slow breaths, about two seconds each, are breathed into the victim's mouth with a pause in between. This is repeated until the chest begins to rise. The victim's head should be repositioned as often as necessary during the procedure. The mouth must remain open and the tongue kept away from the windpipe. 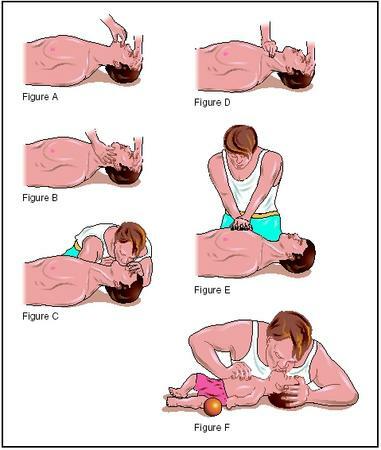 When the chest begins to rise, or the victim begins to breathe on his or her own, the rescuer looks for signs of circulation, such as coughing or movement. If a healthcare professional has arrived by this time, the pulse will be checked before resuming resuscitation. If chest compressions are needed to restart breathing, the rescuer will place the heel of a hand above the lowest part of the victim's ribcage where it meets the middle-abdomen. The other hand will be placed over the heel of the first hand, with fingers interlocked. Keeping the elbows straight, the rescuer will lean his or her shoulders over the hands and press down firmly about 15 times. It is best to develop an up-and-down rhythm, keeping the hands firmly on the victim's chest. After the compressions, the rescuer will give the victim two long breaths. The sequence of 15 compressions and two breaths will be repeated until there are signs of spontaneous breathing and circulation or until professional medical help arrives. Do not give chest compressions if the victim has a pulse. Chest compression when there is normal circulation could cause the heart to stop beating. Avoid moving the victim's head or neck if spinal injury is a possibility. The person should be left as found if breathing freely. To check for breathing when spinal injury is suspected, the rescuer should only listen for breath by the victim's mouth and watch the chest for movement. Do not slap the victim's face, or throw water on the face, to try and revive the person. Do not place a pillow under the victim's head. The description above is not a substitute for CPR training and is not intended to be followed as a procedure. Successful CPR will restore breathing and circulation in the victim. Medical attention is required immediately even if successful CPR has been performed and the victim is breathing freely. People with known conditions or diseases, such as diabetes or epilepsy, should wear a medical alert tag or bracelet. People with diabetes should avoid situations that will lower their blood sugar level. People who feel weak, become dizzy or light-headed, or have ever fainted, should avoid standing in one place too long without moving. People who feel faint, can lie down or sit with their head lowered between their knees. Risk factors that contribute to heart disease should be reduced or eliminated. People can reduce risks if they stop smoking, lower blood pressure and cholesterol, lose weight, and reduce stress. Illegal recreational drugs should be avoided. Seeing a doctor regularly and being aware of any disease conditions or risk factors can help prevent or complicate illness, as can seeking and following the doctor's advice about diet and exercise. Using seat belts and driving carefully can help avoid accidental injury. People with poor eyesight or those who have difficulty walking because of disability, injury, or recovery from illness, can use a cane or other assistance device to help them avoid falls and injury. American CPR Training. http://www.cpr-training-classes.com . American Heart Association, National Center. 7272 Greenville Avenue, Dallas, TX 75231. http://www.americanheart.org . Emergency Cardiovascular Care. [cited April 2003]. http://www.cpr-ecc.org . Severson, Todd. "Cardiopulmonary Resuscitation." Medline Plus. April 2003 [cited April 2003]. http://www.nlm.nih.gov/medlineplus . L.O.V.E your wedsite keepup the good work. Ok it does serve people lives especially in hurricane ,accident, and sickness thank for you kindness. CAN YOU PLEASE SEND ME A PICTURE OF AIRWAY BREATHING CIRCULATION! I HAVE COMPLETED MY CPR COURSE BUT I WANT TO LEARN MORE ABOUT CPR. THANK YOU VERY MUCH FOR THE INFORMATION i GATHERED . i NEED IT VERY BADLY ON MY TRAININING TOMORROW. Thanks,I am a healthcare provider(paramedics)am realy happy with what I have read,but will like to have more send tn my e-mail.thanking u in advance. thanks so much about your article it has realy helped me gain some knowledge that will help me saves someones life some where. THANK YOU VERY MUCH FOR PROVIDING THE INFORMATION ABOUT THE MATTER WHICH I HAVE REQUIRED. I HOPE THE AHA GUIDLINES ARE UPDATED FOR 2010. I have seen a program on TV recenly whereby if you follow the correct resuscitation protocol you can revive a person without any brain damage which have been under water for over an hour. Please advice as to what the correct resuscitation protocol would be please? this is very helpful.pls send this to me..id like to share this to my friends also.im sure they will appreciate it.. Im glad i opened ur site.thank you very much.. I wish i would have known this information earlier. I lost my 15 months son in February due to drowning and rushed to medical center without doing any CPR. Even the Doctors did not bother doing CPR to him and declared him dead although in less than 13 to 18 (the time of his drowning) minutes i reached hospital. Great website. However, CPR compression rate is old rate of 15. Newer rates are 30 and 2. At 100 to 120 per minute for an adult. I am cpr cert. N recently came across a motorcycle accident the woman was not breathing but there was a heartbeat...she unfortunately did not make it although I still did cpr. Is that ok to do cpr when a heartbeat is detected but she is not breathing?